whatever you make..try to skip maida, white sugar and gluten ( wheat flour ,maida, little % of gluten in oats also ). 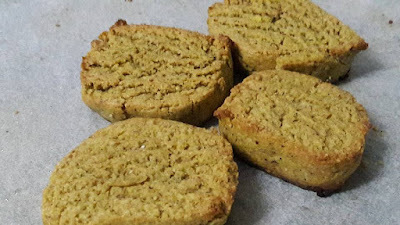 If your want to bake something healthy just preferred coconut flour or almond flour.. gram flour..rice flour etc instead of Gluten Flour..
..Today in my kitchen healthy…gluten free cookie made from loads of Pista Flour and cornflakes. 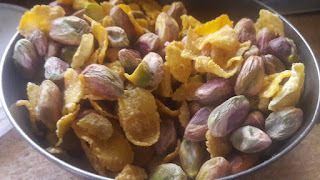 In a blender add corn flakes and pista grind them into a coarse powder. 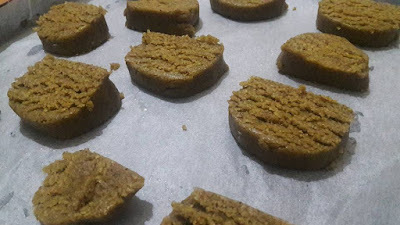 You can even crush them using a rolling pin, but if you leave big flakes they will fall out and cause trouble in shaping the cookies. Mix the corn flakes powder, pista powder and chickpea flour in a bowl. Add Baking powder and give a gentle mix to the dry ingredients and set aside. In another bowl add brown sugar and add cardamom powder. Add Ghee or butter to it along with some Olive Oil. Do not over knead dough. roll like log and keep in fridge for half n hour. Preheat your oven to 180 degree Celsius for ten minutes.